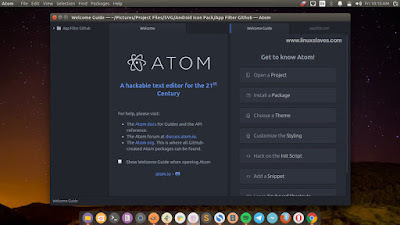 Atom Text Editor 32bit / 64bit in Linux - Atom is an open source and free modern, approachable, yet hackable to the core a tool you can customize to do anything but also use productively without ever touching a config file. In the past I've shared 5 modern programming text editor for Linux. But it lack the installation guide. So, today I will show you how to install Atom on Ubuntu and derivatives via PPA. Built around a minimal core Atom comes with 50 open-source packages (plus a growing library of user-submitted packages) that allow you to create just the right software for your needs. Atom is free, open source, and highly customize-able. It works across operating systems, meaning you can install and use it on Linux, Mac OS X, and Microsoft Windows. You can install latest Atom text editor easily. The packages both 32bit and 64 bit available for Ubuntu 14.04 LTS Trusty Tahr, 15.04 Vivid Vervet, 16.04 LTS Xenial Xerus, 16.10 Yakkety Yak, 17.04 Zesty Zapus, and its derivatives like Linux Mint and Elementary OS. Thanks for WebUpd8 team for the PPA! 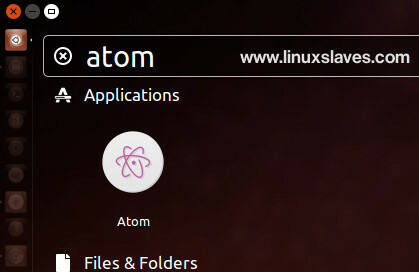 Now you can open Atom via Unity dash, or any Ubuntu app launcher like Synapse Launcher. These were all the step-by-step tutorial installing Atom ( latest version ), a programming text editor for Linux via PPA. For those who don't want to add the PPA, you can grab the .deb packages from its official site.